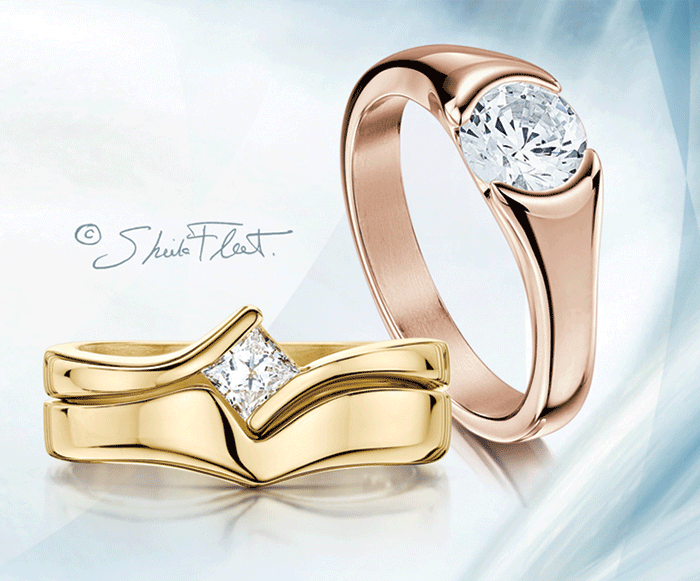 Family-run company Sheila Fleet Jewellery has Orkney-based jewellery designer Sheila Fleet at its head. Sheila is inspired by where she lives, and her collections are grouped into categories such as Land, Sea, Sky, Nature, Tradition and, of course, Love. You have pledged a future together – show off to the world with an engagement ring in silver, gold, palladium or platinum, with handset diamonds, rubies or other precious stones. With this ring I thee wed… For your wedding bands, choose something traditional or ones with a contemporary twist, plain bands or rings handset with precious stones. Symbolise your eternal unity in a beautiful piece made of two rings. Carefully crafted, the rings hold each other, interlocking to form a new, single entity from two separate elements. Beyond the engagement and wedding rings, they have beautiful white, ivory, crystal or coloured jewellery to add the finishing touch to your wedding dress or outfit, and those of key members of your wedding party. Ask about colour-matching your jewellery to the material you will be wearing. For grooms, choose a special piece of jewellery for your special day: a kilt pin or cufflinks to compliment your new wedding ring.